This article is 2964 days old. From murals to masks and pins to needles, a Windsor artist has gained exposure with a Cherry on top. Working at his almost 20-year-old business Rembrandt’s Brush, 47-year-old Dan Lessard knows a few things about art. While his work has appeared in unconventional places, he began just like anybody else. Aside from this, the only training he had was airbrush lessons. With natural talent, Lessard began tackling different projects, including hundreds of portraits and large-scale murals. Most of the latter are in Essex, the biggest being an eight by 40 foot mural with roughly 60 sports figures. From there, Lessard’s career began taking off through experimentation. 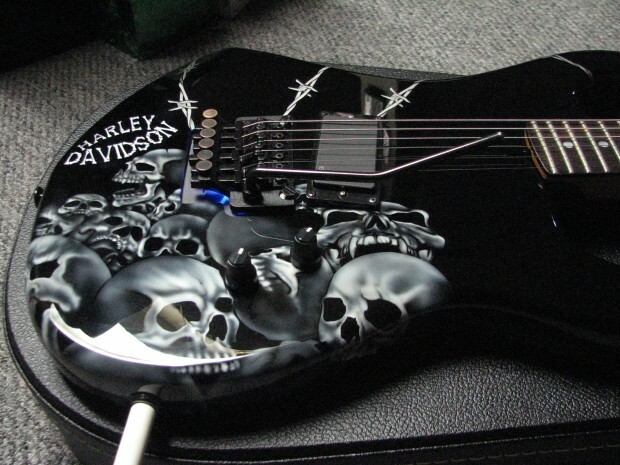 Applying his craft onto a different object, he soon opened the doors to some huge opportunities. In addition to street hockey mask and stick designs for Bauer and Rebok, Lessard began painting for pro and junior hockey teams. His list includes Team USA, Team Canada, Team Russia, the San Jose Sharks, Columbus Bluejackets, New York Rangers and Islanders. Now with about 300 masks under his belt, Lessard has become a veteran of a different kind between the pipes: He also painted two masks for Dwayne “The Rock” Johnson’s movie The Tooth Fairy. In addition to commercial work, Lessard has donated his talents to many charities. 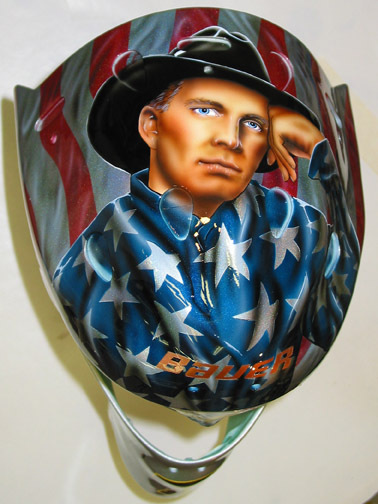 He’s painted a mask for Garth Brooks and has recently done work for organizations closer to home. Beyond providing trophies for the Windsor & Essex Cancer Centre Foundation’s bowlathon, he also contacted a Canadian celebrity to help another local cause. Meeting before through a mutual friend, Lessard contacted the hockey icon. 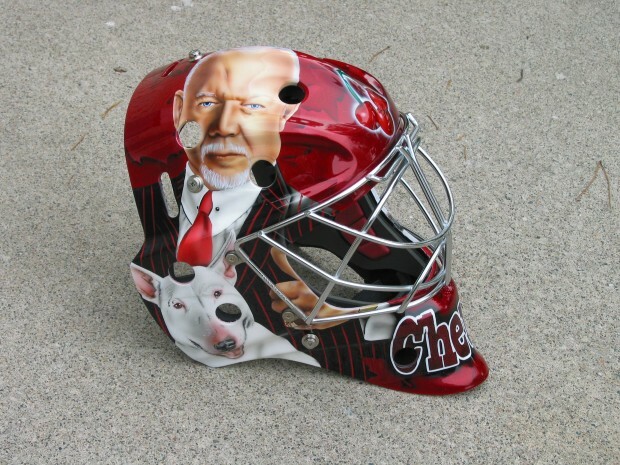 Cherry liked the idea and once the mask was completed, Lessard drove up to the former coach’s home with his dad and two of his children to get it signed in person. If that weren’t enough, Lessard has created several motorcycle designs and began doing tattoos two-years-ago. He enjoys having someone to talk to while working and considers it similar to painting masks. 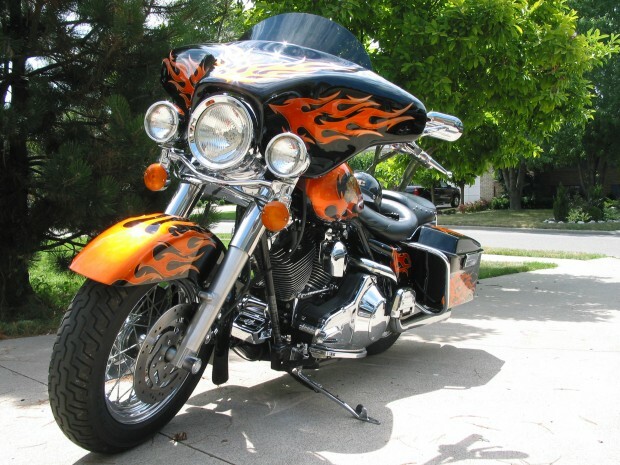 This summer Lessard will lend his talents to create items for the Breast Ride Ever. As for why he continues to help so many causes, he says it’s simple.